Come and Visit Atlantic City's North Beach Area (the Inlet). Centrally located to all major attractions including "The Walk Shopping Outlet". Come and stay at a newer and well-furnished three level beach house with surround sound throughout that includes great amenities, Such as Wi-Fi internet service for those who need to stay connected, cable TV for those who like watching their favorite TV shows and movies. This relaxing beach house is located steps away from the beach and boardwalk, minutes away from your Favorite Casino, Convenient to Shopping (the Pier at Caesars, the Atlantic City Outlets), Reliable Public Transportation (Jitney Service), Fine Dinning and a Wide Variety of Entertainment and Activities. You Will Be Staying at Your Home Away from Home that Offers Spectacular Views of the Ocean, a Warm Summer Sea Breeze from the Second Floor Balcony During the Afternoon and Evening. Your beach house is in walking distance to the Historic Gardner's Basin which offers waterfront dinning, boat rides, boat tours, antique shops, and the Atlantic City Aquarium. A great place to visit. Your beach house is steps away from the sandy beach and boardwalk. You can walk along the boardwalk and visit the Show Boat Casino and House of Blues. (Less than one mile away) Great views of the sun rising in the morning and setting in the evening. Great view of Brigatine Island from your second floor balcony. Visit the Atlantic City Outlets which is less than two miles from your beach house. The Jitney bus service provides quick transportation to and from the outlets. 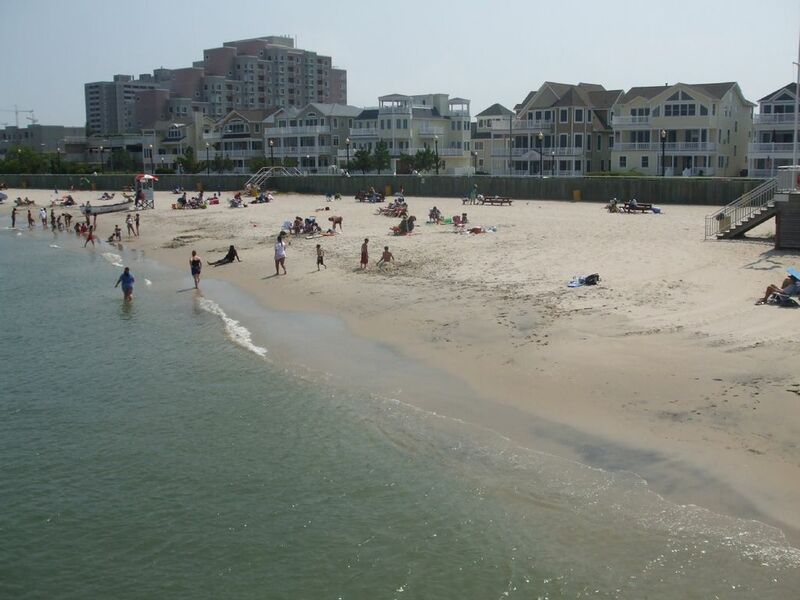 The Jitney bus stop is located less than one block away from your beach house. Owner is licensed real estate agent. Centrally located all attractions in Atlantic City. Conveniently located to the Revel, Borgata and Showboat Casino/Hotels. Within walking distance to the Historic Gardners Basin which offers fishing trips, boat tours/rides and casual dining overlooking the Bay. Nice view from second floor balcony. No Smoking in House Allowed. House parties are prohibited. Linen, Towels, Pillows are now provided for our guest. Home was comfortable and had great space. We really enjoyed the quiet neighborhood and proximate to the beach and boardwalk. The kitchen has most of what we needed. Would have liked a few more kitchenwares. But other than that we were very happy and are actually coming back in three weeks. We had a great time. Due to our fault, the home was not supplied as we are accustom to. Being a spring, summer, and fall renter, the properties we rent usually have the basics, paper plates, napkins, tissues, toilet paper, and such. We were unprepared. A short trip off of the island to the store and the problem was fixed. We had a great time. The house was clean and ready for check in at the scheduled time. Graling was very helpful with emails pertaining to check in and check out. We just used the linens provided in the hallway closet for the bedding and the towels for the bathrooms. The one negative was the doors. Every time the door opens a chime sounds, FRONT DOOR or BACK DOOR. This can become annoying when you are in bed and the doors are either opened or closed. All in all, the property was as advertised. Very close to the casinos and restaurants. The Jitnee did not stop at the bus stop close to the house. I believe that this was because the aquarium and basin were closed. The Jitnee kept turning a couple blocks short, so be prepared to walk if your down here in the winter. Thank you Graling for allowing my family and friends to enjoy your home. Tom. Great place. Close to the beach. The house was the perfect size for my family and in a very convenient area. The kitchen was fully stocked, which was great. The house is located down the block from the beach and not to far from a nice little ice cream parlor. We really enjoyed our stay. Thank you very much for your review and feedback relative to our home in AC. I am happy that you and your family enjoyed our beach home. Please keep us in the mind the next time you're visiting AC. We greatly appreciate your business. Take care!! The house is big enough with plenty of rooms and bathrooms. Very clean, the owner was very responsive to any questions we had. There is a small beach within one block. Very nice and quiet area. We have used Homeaway for several years. This is the first time I've ever left a negative review. The only good things about this property were the size and location. Upon entering we noticed that the carpets were filthy. I notified the owner and he said that carpets were shampooed as needed and he'd look at them when we left. He never offered to take a look or have them cleaned for us. Walking on the carpets literally turned our feet black. The entire house was dirty. We had to clean out kitchen drawers and cabinets in order to use them. Drawers were covered in black grime and filled with random items and trash. We had to buy and change out the smoke detector battery. Neither of the two DVD players we tried worked. The TV in the middle bedroom was not anchored and almost fell on my sister's head. There were random items such as old phones and cords in bedroom dresser drawers. We had to buy ant traps and put them throughout the house. There was mold/mildew inside the broken shower/bath fixtures. The top rack of the dishwasher was broken and it fell out every time it was opened. The pillows and seats on the third floor were water stained and filthy. The front bedroom closet door was completely off it's hinges. There was dust, dirt and trash under beds and dressers. The refrigerator was dirty inside. The downstairs storage closet was dirty and had old but shells in the floor. Metal items such as paper towel holders were old and rusted. There were multiple broken window blinds and the upstairs patio door deadbolt was broken. There was black grime on the underside of faucets that had not (and possibly never) been cleaned. Bathtubs and showers had caked in dirt. The third floor was basically not usable because it was so hot up there. This was the dirtiest place I've ever stayed, including hotels. Every time I turned around something was broken or filthy. I have not been offered a refund nor have my concerns been addressed by the owner. The condition of this property ruined my entire trip as I spent a lot of time in the home with children while my husband worked. For the price I paid I expected much more, but I always expect basic cleanliness. I was sorely disappointed in the property and how my concerns were addressed. The owner did not even acknowledge my second email. It was a terrible experience. This is in follow up to your email. First, thank you for providing us with feedback around your stay. As I recall, when you first checked in you mentioned to me a couple of items followed by saying no big deal, we are comfortable. Then you brought to my attention the condition of the rug and I mentioned that we would look at the rug once you checked out and that we clean and shampoo our rugs on an as needed basis. Based on our last inspection prior to you checking in, we did not believe the rugs needed cleaning. You did not request that we come in and clean the rug, so we did not schedule anything. I disagree with your assessment of the refrigerator because it was clean. The fore mentioned storage closet, is simply a utility closet which consists of the heater, air conditioner, mop, bucket, broom and small ladder and should not be used for storage. Please note there are several closets available for storage. The property is routinely exterminated. I am willing to reimburse you for the two(2) ant traps that you purchased. The single blind damage occurred by previous renters. I refuse to replace the entire wood blind since it is functional and provides privacy. The deadbolt works, but requires a slight adjustment of the door (shift upward). There is no safety issue in the front of the house, 2nd story in that the door lock and safety bar work. It would be very difficult to gain entry in the front of the home in such a busy neighborhood and located next to a city official. The 3rd story or tower does have an operable ceiling fan. Heat rises and is totally out of my control even though the air conditioner works. The dishwasher is operable, however, the top rack requires a re-alignment prior to the wash cycle. I will not replace the dishwasher due to a faulty rack. Thank you for informing me that the DVD in the family room is not operable. It will be replaced. I am aware of an additional phone and cord in the master bedroom nightstand drawer, however, I am not sure how that would negatively impact your stay or storage capabilities since there are other available drawer space in the master bedroom. Unfortunately, I am unable to determine when a bulb will burn or battery will fail. Thank you for bringing this to my attention. I am willing to reimburse you for the battery cost. I will share your comments with our cleaning company for their records. Finally your comments were addressed through Homeaway. Deep Sea Fishing Available at the Historic Gardner's Basin. Casual dining and boat tours also available. During the month of July there is a 3 night minimum. During the month of August there is 3 night minimum. $300 security deposit required at least 30 days in advance of rental period. Accept online credit card payments.